Maybe all the spring skiing I am doing has put me in a great mood, or perhaps the beautiful Adirondack weather has addled my brain. 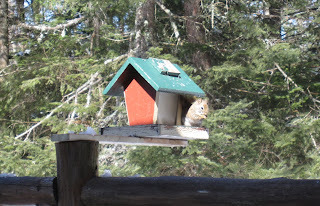 I usually do not approve of the red squirrels stealing bird food because the birds are afraid of the squirrels and stay away. Yesterday however, I didn't even mind this hyper-active thief when I caught him stealing, 'red' handed, of course. I decided to open the window and see how long he would hang out for his photo shoot. 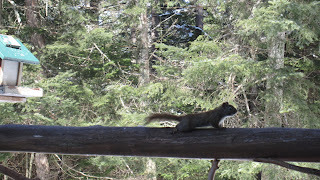 The red squirrels always amaze me because they seem quite courageous for such little animals. They have supreme confidence in their scurry speed and agility. 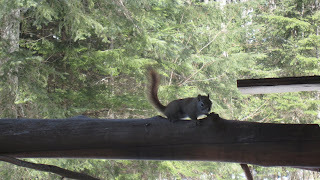 Today's blog star continued his mad seed gnawing even after I opened the window and started taking his picture. He didn't move until I leaned out the window toward him, which resulted in the face-off captured below. I am not saying he told me this, but I had the feeling he wanted me to just leave him alone. So I said, "Bon appétit!" and shut the window since there was snow to be skied and views to enjoy.